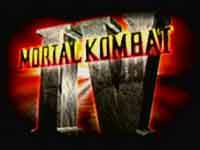 Two of the earlier looks of the Mortal Kombat 4 logo. In the early stages of the development of the game the select screen went through a lot of changes, from different positions for the characters to different icons. These are only three of the very early versions of the character selects screen. Probably the earliest of them all (July 25th, 1997). 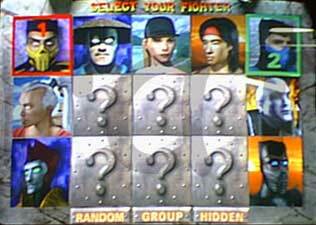 This is the way the select screen looked on the first public version of the game, the one from the Mortal Kombat 4 Road Tour. 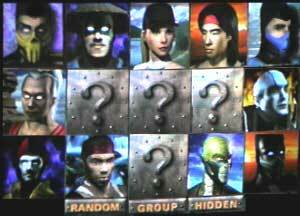 It has nine selectable characters: Scorpion, Raiden, Sonya, Liu Kang, Sub-Zero, Fujin (different icon from the final), Quan Chi, Shinnok (different icon from the final) and Noob Saibot (yes he was selectable in this version). All question mark fields are empty. This is the select screen from the second beta released on August 9th, 1997. Kai and Reptile are now selectable. Shinnok and Fujin have new icons. The select screen of the third beta version that was released on August 18th, 1997.  The icon for Shinnok has once again been changed. And Tanya makes her first appearance in the Mortal Kombat universe. After these three changes, the select screen kept changing. Unfortunately there are no available images yet. A couple of things are sure. Noob Saibot disappeared from it and Johnny Cage, Reiko, Jax and Jarek were added. The truth is, that Noob Saibot was originally going to be in the arcade version of Mortal Kombat 4. He made an appearance in a few of the earlier versions of the game. 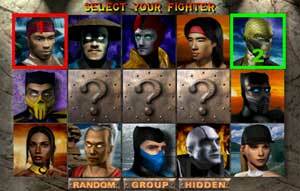 Unfortunately the game needed more new characters and so in beta version 5 (Released: September 2nd, 1997) Noob Saibot's place on the character select screen was taken by the Kano-like character Jarek. And so Noob Saibot skipped the first official release (known as Revision 1) of the game. Noob Saibot also made an appearance in the first beta version (Released: September 26th, 1997) of the second official release of the game. In the second beta version, his place was taken by the newcomer, Reiko. This is unfortunately the last appearance of Noob Saibot in the arcade version of Mortal Kombat 4. Noob Saibot made it however as a hidden character in the home versions of Mortal Kombat 4. 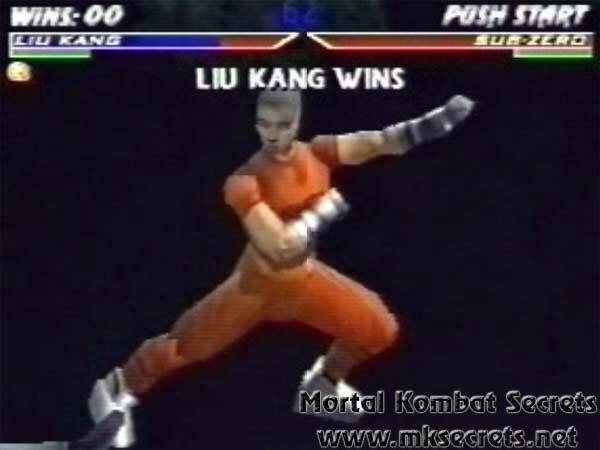 Unfortunately without his signature special moves he was no longer the great fighter from Mortal Kombat Trilogy. 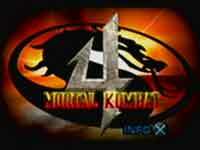 Kitana was originally planned to be in Mortal Kombat 4. However, her color palette was changed to brown to make Tanya. Her coding is still in the N64 version of the game, and she can be accessed with a GameShark Kode. Her coding is also in the PC version, but it can be only accessed via a trainer or an unofficial patch. While Kitana's model and textures were deleted from the PlayStation version, her moves were left in, and can be assigned to any character with a GameShark. Like Kitana and Noob Saibot, Kano was also planned for MK4, however, due to there not being enough new characters in the game, they left Kano out of the roster and put Jarek instead of him. Jarek directly had Kano's signature moves and fatalities, which caused a lot of complaints from fans simply born by the fact that there was nothing original in Jarek. 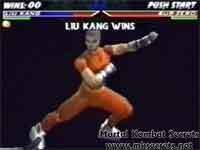 The image below shows an early, probably test model of Liu Kang, which has been shown in one of the gameplay videos before the release of the Nintendo 64 version of the game. I don't think that someone knows for sure who or what this is. 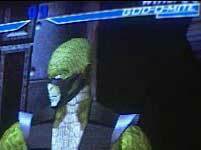 The only known things are that in prerelease trailers both Reptile and Fujin had God-O-Mite as name in their lifebars. Originally the GameBoy Color version of Mortal Kombat 4 was going to have Johnny Cage, Kai and Sonya instead of Quan Chi, Liu Kang and Tanya. This changed in later stages of development. However a select screen and two screenshots with the old characters are still present on the back cover of the game.